‘Universal Credit payment levels fall far below the actual cost of a decent standard of living in the UK’. A national petition calling on the UK government to fix Universal Credit was presented at 10 Downing Street earlier this week. 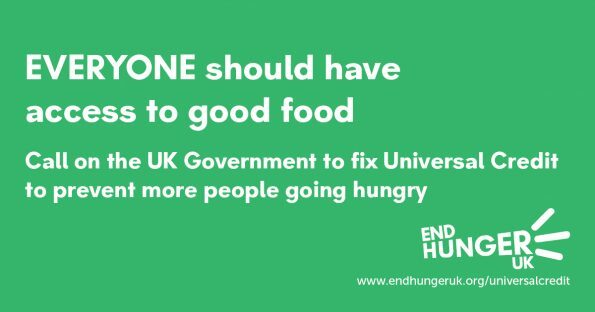 The petition, organised by the End Hunger UK campaign, has been circulated and signed in food banks around the country by Universal Credit claimants, people experiencing hunger, and food bank volunteers and supporters. In total, over 18,000 people have signed it. The petition was presented at Downing Street by Tony Carson and Sue Rimington, who spent several weeks living in a tent this summer after moving on to Universal Credit, surviving on £4 a day between them. They were joined by managers from The Trussell Trust and independent food banks and Amanda Button, who has worked with many Universal Credit claimants through her voluntary work with anti-poverty organisation ATD Fourth World. Increased awareness and implementation of Alternative Payment Arrangements. Reducing the level of loan repayments from 40 per cent to 10 per cent. Last week’s Budget statement suggested that the government recognises that Universal Credit must be fixed. And some changes announced by the Chancellor are welcome, but for many living in food poverty in the UK these changes do not go far enough. In July, nine organisations who are members of the End Hunger UK campaign published a report entitled Fix Universal Credit. This recommended short, medium and long-term changes to Universal Credit, based on information and insight from more than 70 food banks, emergency food providers, and those assisting people in food poverty across the UK. 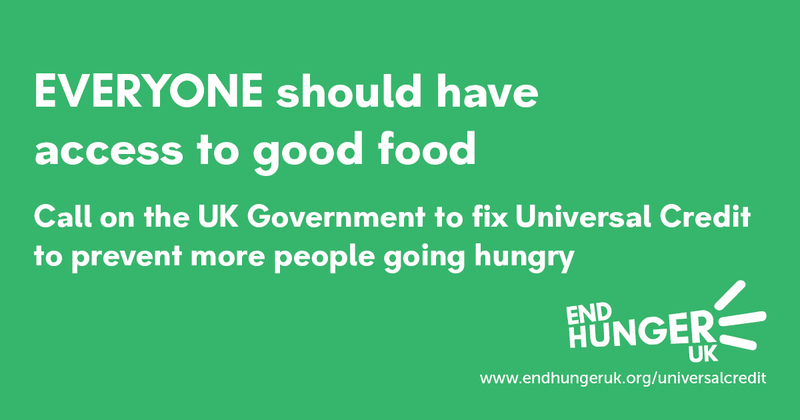 End Hunger UK welcomed the government’s announcement that it will reduce the maximum rate at which deductions can be made from Universal Credit from 40 per cent to 30 per cent, but its report highlighted that repayments should be reduced to 10 per cent a month. End Hunger UK is also concerned that these changes will not be put in place until October 2019, meaning thousands of claimants will not feel the benefit of this change. One food aid provider told End Hunger UK: “I saw one client who said he’d had an advance payment and had such a struggle paying it back he wasn’t ever going to risk asking for another. Sadly, the budget statement did not address the administrative and design problems inherent within Universal Credit. For example, a short-term, much-needed change would be to allow new applications to be made over the phone, as opposed to operating a solely online system, which is not accessible to those without internet access. And there has also been no recognition of the need to end the ‘benefits freeze’. Nor that Universal Credit payment levels fall far below the actual cost of a decent standard of living in the UK. Emma Revie, chief executive of The Trussell Trust, said: “We created our benefits system to make sure support would be in place for each other, but if Universal Credit is to continue this legacy, more must be done. “Foodbanks in our network have been clear: waiting weeks for a first payment, not being able to access support and receiving payments that just don’t cover the cost of essentials, are forcing people to use foodbanks. And Sabine Goodwin, of Independent Food Aid Network, on behalf of End Hunger UK, said: “Around the country, the Universal Credit system is not working. “The changes in last week’s budget were a step in the right direction, but do not go far enough and lack the urgency required. “The Fix Universal Credit petition has drawn support from all over the country.